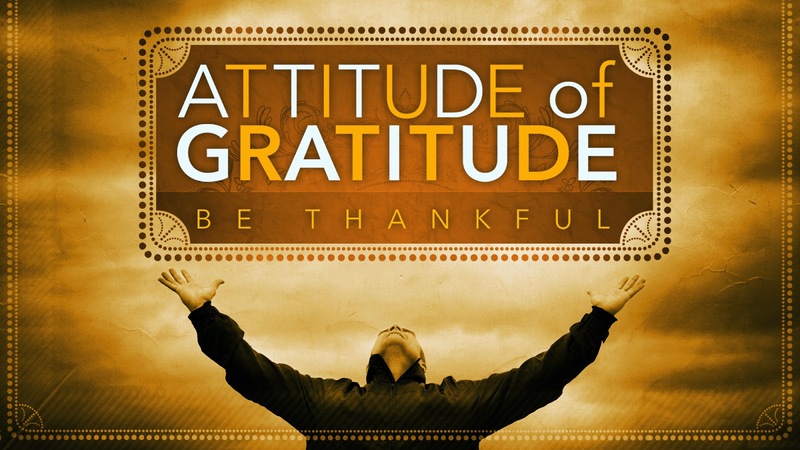 Attitude of Gratitude Week Four - "Enduring Love"
Have you ever heard that before? Maybe you've even repeated it on occasion. Probably when something good was coming to an end. What? I should tell you everything? At any rate, as we came to the end of our time away we both found ourselves saying over and over again---"just one more day... if we had just one more day..."
I remember the last football game of my oldest son's high school career. He re-injured his surgically repaired shoulder throwing a forty yard touchdown pass, and then a few plays later got concussed on a running play. We all knew that it was over. His season had ended, and a promising football career with it. I remember my wife and I sitting with him on the sidelines and all of us wishing that he had just one more chance to go out on to the field and make the crowd roar. I actually grieve when my favorite TV series come to an end. I was stunned and at a loss for words at the conclusion of the Sopranos--my favorite TV guilty pleasure for nearly a decade. When I watched the finale of the Office, I actually cried. Yeah, I know. I am a wuss. I remember once my wife and I ate dinner at this really fancy restaurant with some friends on New Year's Eve. It was one of those meals where they kept bringing out course after course--every one of them looking as if they were prepared on Food Network for one of those cooking contests. None of us wanted that dinner to end. And we sort of grieved when it did. Because all good things, however, must come to an end, don't they? That's what we tell ourselves, isn't it? Except sometimes this applies to things that are near and dear to us. I have listened to couples who are at the end of their rope in their relationship tell me how things used to be when they were in love. I have visited people in nursing homes and hospitals who once wielded great influence and power, but now are relegated to watching daytime TV and sitting alone in a chair. I have sat at the bedside of people who are dying, but who desperately want to hang on to life. Because all good things must come to an end---or so we have been taught to believe. But what if I told you that there was one thing that didn't come to an end? And that this one thing assured that all of the really good things didn't have to come to an end either... What would you say to that? After all that I have just related, after all that you know about the way the world works... would you believe me? Really? Another way to translate that verse is "his mercies--his lovingkindnesses---never come to an end... they are renewed every morning." The lovingkindness--the mercy--the faithfulness of God never... comes... to an end. How good does that sound? It sounds awesome, and yet far too many of us read something altogether different into the text. What if Lamentations read something like this: "The wrath of God never comes to an end... it is renewed every morning..."
That doesn't sound all that awesome does it? So why do so many of us live like that's what the Bible says? I mean if you listen to the sermons that are being preached across America today in countless churches all over the landscape you would think that God is angry... that God is vengeful... that God's wrath is renewed against us each and every morning. Come on. I know you've heard people say things like this. But that's not even close to what the Bible says, is it? The God that is really revealed in the Bible--when you actually read it instead of just quoting random verses from it--is a God whose mercy, whose lovingkindness, whose faithfulness... never ends, never runs out, never goes away. There's this hymn in the Bible--a psalm, to be exact. Psalm 136 to be even more exact. For thousands of years this psalm has been sung, recited or prayed by the people of God in gratitude to all that God has done and continues to do for the people of God. This psalm is called The Great Hallel or the Hallel al Gadol and it is recited communally in the Jewish tradition at the high holy days, but most importantly at Passover. For those of us who are gathered here today, we are going to read this Psalm responsively--which means I am going to read one line, and then you'll read the next. Your part is easy, though. The only line you have to read is this one: His love endures forever. The word for "love" in this translation is actually hesed which means lovingkindness, mercy, faithfulness... you get the picture. One translation of the word used here goes something like this: "tender mercy to the coming of the age." Some rabbis believe this was first sung by Moses and the Hebrew people after they fled Egypt and were wandering in the wilderness. Others attribute it to David, who was said to have ordered the priests to sing it every day. Solomon had the Great Hallel sung at the dedication of the Temple when the ark of the covenant was being brought in by the Levites. Smoke filled the Temple at that moment, signifying the presence of God. The psalm has a simple structure: A call to give thanks, causes for giving thanks and then a final call to give thanks. The refrain, "his love endures forever" occurs 26 times. It's an ancient ear worm that reminds the singer to give thanks for all things that God has done, is doing and will do--to give thanks for God's presence in History, Creation and the Future. This psalm helps us understand how much we need God's mercy and lovingkindness... all of the time. We all know this deep down inside. Regardless of how much we try to do life on our own terms, we always seem to come back to that notion that plagues us--the one about how all good things must come to an end. And we realize that doing life on our own terms doesn't leave us with all that much---especially when everything we hold dear has a shelf life. Which is why it's also important to note that this psalm helps us understand that God's mercy never runs out. Ever. So no matter what good things have come to an end---we don't have to be afraid. God's mercy, his lovingkindness will never run out. And because of this knowledge, we also have hope that even the good things that seem to always be ending--these things have a different kind of shelf life in the kingdom of God. In the pentecostal and African-American strains of Christianity there is a refrain that is very similar to this. It goes like this: "God is good--all the time--all the time--God is good." Let's say that together again. "God is good--all the time--all the time--God is good. Listen... There is a difference between what lasts forever and what doesn't. And figuring this out can make all the difference in your life. "All good things come from God," the Apostle Paul wrote. If all good things come from God, and God's lovingkindness, mercy and love never end---then doesn't it stand to reason that all of the really good things, the eternal things, the things that matter... will also never end? What Psalm 136 reminds us is that we have a choice---we can dwell on things that are eternal, or we can focus on things that will pass away. Jesus himself reiterated this kind of choice when he told his disciples, "Don't lay up your treasures here on earth were moth and rust will corrupt them and thieves will break in and steal, but lay up for yourself treasures in heaven..."
So what would it look like if you lived your life for the forever moments? What would your life be like if you lived for those moments? You can live believing that God's wrath is renewed every morning, and that all God really wants is to punish the wicked, pour out anger on those who are sinning and smite everyone with a mighty smiting. Maybe that fits your world view. Maybe you kind of want God to do all of that stuff. But then after a while that vision of God begins to affect every part of your life, and you discover that all you're really focusing on are the things that you're losing, the things that are ending and passing away. You have a choice. You can live focusing on how all the good things in life come to an end. Or you can live focusing on how all the best things in life last forever. When mercy seasons justice (Act IV, scene 1). God's mercy did drop from heaven--so to speak---in the person of Jesus Christ. The lovingkindness, the everlasting love of God was embodied in Jesus. The Cross that Jesus died upon is a witness to that love and the lengths to which God will go in order to be in a life-giving, loving relationship with you. It is God's desire for you that you live your life focused on the eternal. It is God's desire for you that you embrace the truth of his Son Jesus Christ--that through him we have eternal, everlasting, never-ending life. Some of you have been searching for this kind of hope for so long. What if the forever-things you've been searching for all this time have been right in front of you? You keep saying, "I'll start following Jesus when I get my life straightened out." "I'll be all in with Christ when I figure out how to get through all of this negativity." "I'll be a Jesus-follower when I get through this bad patch." Did you ever think that maybe your way through all of that junk is Jesus himself? Jesus is proof that God's love endures forever. He went willingly to an agonizing death on a cross. He was raised from the dead as a sign and symbol of God's victory over sin and death and all that will pass away. Jesus is proof that you don't have to live in fear, dread or despair any longer. Jesus is proof that God is good all the time---all the time---God is good. This is the essence of the message of Psalm 136--the refrain that we read 26 times just a moment ago. Say it with me: "His love endures forever." When you feel like the good things around you are coming to an end: "His love endures forever." When you realize all of incredible blessings that God has given you: "His love endures forever." When your world seems to be falling apart: "His love endures forever." When you feel like your heart might burst with joy: "His love endures forever." When you finally realize all that God has done for you: "His love endures forever." This is your "canticle of praise" as the old hymn says. Your song, your thanksgiving. Because when you finally realize al that God has done for you--in all the ways God has been faithful, loved you, rescued you, cherished you, redeemed you and will never leave or forsake you--the only true response is gratitude. God is good---all the time--all the time---God is good.